Beautiful - exactly as I expected. 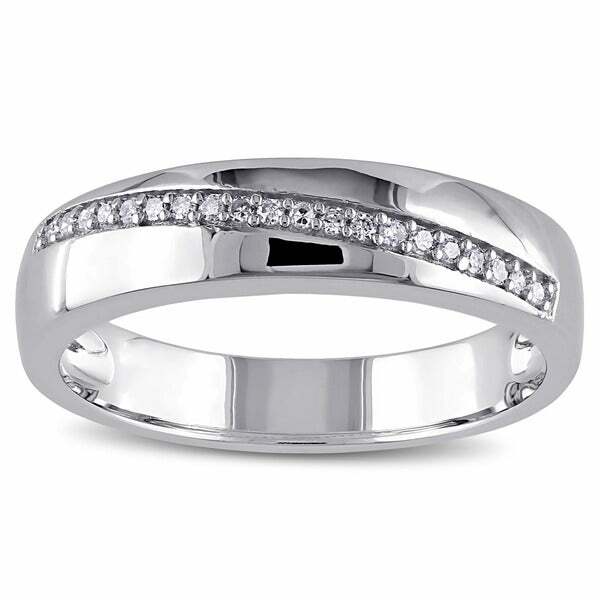 Your man will love this sterling silver wedding band from the Miadora Collection, complete with 20 round-cut white diamonds prong set into the band at a diagonal. The high polish finish and classic shape are sure to complement his everyday look. All weights and measurements are approximate and may vary slightly from the listed information. *T.W. (total weight) is approximate. 1/10 carat T.W. may be 0.08 to 0.12 carat. Treatment code N (diamonds). See Treatment Guide for further information. Purchased this ring for my husband for our wedding. He loves it!!! No too much but just enough bling. He's a chef and didn't want anything too extravagant. This was a great choice!! the ring is very nice it is not as flashy as i would had like it to be for a man. but my husband likes it and he says that it fit comfortable on his hand so if he is okay with it so am I.
I like the fact that my husband's ring came two days early. He loves his new ring and so do I. I love shopping with Overstock.com it's very affordable. My husband loves this ring!! my husband and I decided to get married quickly when I was diagnosed with cancer a couple of months ago. I ordered this one quickly and it has worked just fine. Nice ring. Gorgeous... I would recommend buying this ring to anyone. Originally came as pictured and was nice at first, but over the years it turned. It just really nice. My better half was looking at one at Zales but I think he will love this better. Very nice ring!!!!! True to sizing. "can i engrave this ring"
Hello ROSE&OKE.ILVU, unfortunately Overstock does not provide engraving services. This ring is engravable. Please let us know if you have additional questions. Thanks for shopping with us. This ring is gorgeous and perfect for my soon to be husband. My daughter told me about this site and I think she was right. It's easier and I took my time. My Husband love this ring.